A great earnings report and strong guidance led to monthly gains. What: Shares of professional-networking site LinkedIn (NYSE:LNKD.DL) jumped 19% in February, according to S&P Capital IQ data, as the company delivered another fourth-quarter earnings beat on Feb. 5 -- continuing a perfect streak of exceeding analyst expectations. Following the report, upbeat CEO commentary and strong full-year guidance led to a gain of 10.7% in the following day's trading session. So what: In LinkedIn's fourth-quarter earnings report, the company beat analyst revenue expectations of $617 million by 4.2% by reporting $643 million in revenue. As far as earnings per share goes, non-GAAP, the company fared even better by reporting $0.61 versus consensus figures of $0.53 -- a beat of 15.1% and a gain of 56% over the previous year's corresponding quarter EPS of $0.39. On a full-year basis, the company reported total revenue of $2.2 billion in 2014, a gain of 45% over the previous year's revenue haul of $1.5 billion. In the press release, CEO Jeff Weiner commented, "The fourth quarter capped another successful year for LinkedIn, which was marked by steady member growth and strong financial results. We continued to make significant progress against a number of multi-year, strategic initiatives including mobile, jobs, content, and global expansion." Now what: More importantly, the company's full-year guidance pointed to future growth. The company provided full-year guidance at a midpoint of $2.94 billion, up 33% from the previous year's report. The company has continued to broaden its global reach with 70% of total members coming from outside the United States. Early in 2014, the company went headfirst into China, and doubled its Chinese member base from 4 million to 8 million in the process. Not only revenue, the company is also projecting adjusted EBITDA growth. For 2015, the company guides for $785 million versus adjusted EBITDA of $592 in 2014, a matching gain of 33%. 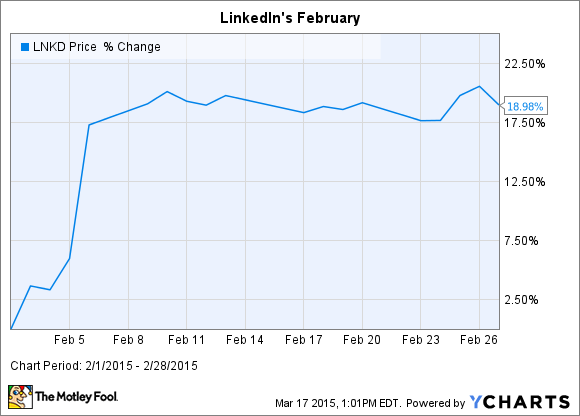 Overall, LinkedIn continues to operate well and expand at a strong pace. And if analyst expectations are any indication, you shouldn't underestimate the company.